A renowned career diplomat, Philip C. Habib (1920-1992) was an authority on Southeast Asia, a peace negotiator in the Middle East, and a special envoy to some of the world's most dangerous flash points. The portrait of Philip C. Habib is a detail from an undated photograph by Bruce Hoertel. Beginning in 1965, Habib served as a political counselor in Saigon just as the Vietnam War was escalating, and he soon became an expert on the region, serving in Washington as Deputy Assistant Secretary for East Asian and Pacific Affairs and then serving for three-and-a-half years on the Vietnam peace talks in Paris. From 1971 to 1974 he served as ambassador to South Korea. From 1976 until 1978 he served as Under Secretary for Political Affairs. He also served as Diplomat in Residence at Stanford University. 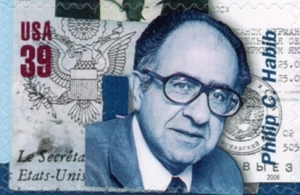 Born in Brooklyn, Habib studied forestry at the University of Idaho and earned a Ph.D. in economics from the University of California, Berkeley. In 1949 he became a Foreign Service Officer and was subsequently posted to Canada, New Zealand, and Trinidad. Habib retired for health reasons in 1980, but in 1981 he came out of retirement for a series of high-profile special assignments. He served as President Ronald Reagan's personal representative to the Middle East, where he spent two years engaged in high-profile shuttle diplomacy that helped reduce tensions in the region. He also served as a special envoy to the Philippines and Central America. In 1982 Habib was awarded the Presidential Medal of Freedom, the nation's highest civilian award.